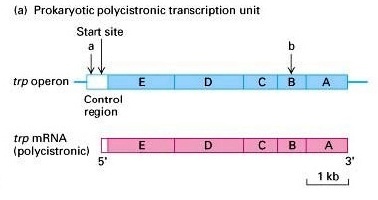 Eukayotic mRNA molecules are monocistronic, containing the coding sequence only for one polypeptide. In prokaryotes individual bacterial mRNA molecules are polycistronic having transcripts of several genes of a particular metabolic pathway. 1. Contains codons of a more than one cistron. 2. Codes only for more than one protein. 3. Is transcribed from a more than one gene (cistron) and has as many as initiation and termination codons. 1. Contains codons of a single cistron. 2. Codes only for a single protein. 3. Is transcribed from a single gene (cistron) and has one initiation and termination codon.